How to get on the top 10 results of Google's Search Engine Result Page? When you do a search using Google, Yahoo, Bing or any other search engine, results are shown on a Search Engine Results Page also referred to as SERP. Your objective is to be one of the first links on the first SERP because this increases the chances of someone clicking on your link dramatically. 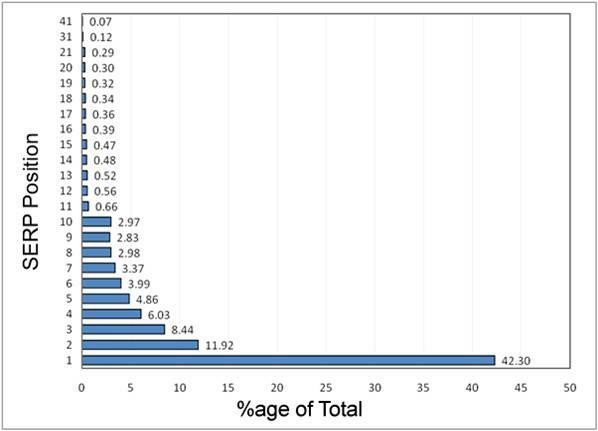 The following diagram shows the importance of SERP position (source: study conducted by AOL in 2006). The first link on the SERP is almost 4 times more likely to be clicked on than the second and 7 times more likely than the third link. What is interesting to note is the drop between links 10 (2.97%) and 11 (0.66%). This is because only 10 links are displayed on each SERP. To get to the next 10, the user has to click on page 2 and this reduces link visibility considerably. PPC campaigns involve paying money to get your ad to show on SERPs when certain keywords or phrases are searched on the internet. The more you pay relative to the competition, the more likely your ad will be placed on the top SERPs. Popular keywords and key phrases are more expensive than less popular ones, so the price you pay depends on the popularity of the keyword or key phrase. PPC campaigns can get you quick results but at a cost because each time someone clicks one of your ads, you will have to pay. This involves updating your website so that search engines display your site when certain keywords or key phrases are searched – this is called search engine optimization (SEO). The SEO process takes time because it may involve modifying your site’s content and structure. Results from SEO work don’t appear over night; search engines such as Google, Yahoo and Bing scan through sites (this process is called indexing or crawling) slowly and gradually. Search Engines crawl, they don’t run. It may take several weeks and even months before results from SEO work start showing. The benefit of investing in SEO is if it is done properly, the traffic that it generates is free – also called organic traffic. Organic traffic comes from visitors going to your site because they found you on non-advertisement section of the SERP. This means that unlike a PPC campaign, you don’t have to pay people to go to your site. 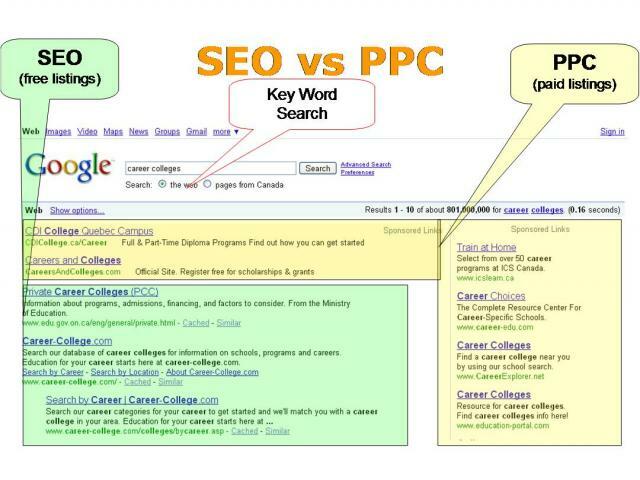 At CanadianSchoolGuide.com we recommend you use a combination of both strategies: PPC and SEO. The importance and weighing of each strategy depends on your budget and your objectives.